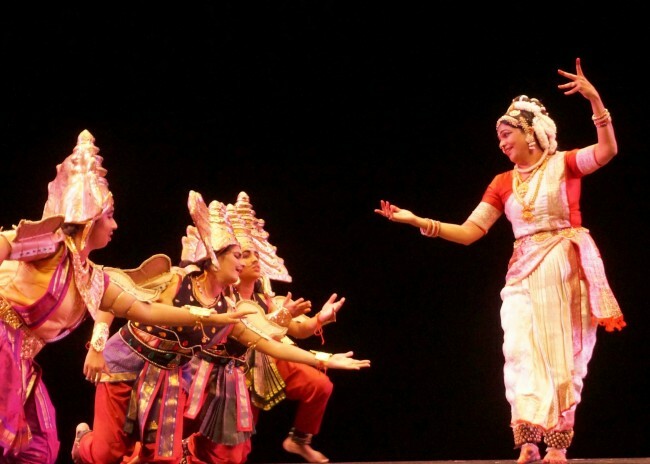 Atlanta, GA, October 11, 2018: The Atlanta chapter of the Sankara Nethralaya Opthalmic Mission Trust (SN OM Trust), a 501(c)(3) non-profit, organized a sold out show of “Ksheera Sagara Mathanam” kuchipudi dance ballet in Atlanta. The event raised a total of US$75,000 which will provide the gift of eyesight to about a thousand needy, economically disadvantaged individuals through cataract surgeries in India. Enthusiastic donors and supporters showed up on the afternoon of the 9th of September at the Infinite Energy Center, daring incessant rain. The proceedings started with Bala Reddy Indurti, Trustee of SN OM Trust welcoming the guests and introducing the mission of the trust, which is to provide the gift of eyesight to the economically disadvantaged. He then introduced Pramod Sajja of Paramount Software as the guest of honor and spoke of Mr.Sajja’s unflinching financial support to a variety of worthy causes. The Trust Vice President Dr.Seshu Sarma paid tribute to late Vempati Ravi Shankar, a great Kuchipudi artist to whom the ballet was dedicated. Ravishankar, the youngest son of Padma Bhushan, Late Guru Dr. Vempati Chinna Satyam, she said, was remembered for his unparalleled performance as Siva in Ksheera Sagara Mathanam, staged in Atlanta in 1994. He reached heavenly adobe at a young age of 49 earlier this year. Then she introduced the show ‘Ksheera Sagara Mathanam’ (Churning of the Milky Ocean) with a special emphasis on the hidden meanings and symbolisms of the story, and their application to dharmic living. For the next two and half hours, the mesmerized audience were transported into the world of devas and asuras (angels and demons). The scenes depicting the devas approaching Lord Vishnu for his guidance on being relieved of the suffering by the asuras, upon the Lord’s guidance devas using diplomacy to team up with the asuras for churning of the milky ocean ably supported by the mighty serpent Vasuki, the emergence of poison from the ocean and its graceful acceptance by the Lord Shiva, the arrival of the divine physician Dhanvantari, Goddess Lakshmi, along with numerous other treasures, all unfolded in visual splendor. The epic portrayal concluded with the arrival of the Lord Vishnu in the form of Jaganmohini and His rescuing the devas from the asuras and giving them the nectar of eternal life. Thanking all the actors, production crew, and the volunteers who made the event possible, the producer and director of the ballet (who also portrayed the role of Jaganmohini in a spellbinding manner) Guru Sasikala Penumarthi of the Academy of Kuchipudi dance, paid tribute to the composer of the ballet and a stalwart of this art form, Late Padmabhushan Guru Vempati Chinna Satyam. Guru Sasikala was greatly supported by her husband Ravi Penumarthi who was instrumental in co-planning the event. The program concluded with the vote of thanks by Moorty Rekapalli, trustee of the SN OM Trust, who recognized many who made the event a tremendous success. Melodious orchestra support for the ballet was provided by Subhashini Krishnamurthi, Subra Viswanathan, Prasanna Venkatesh, G.S. Rajan. Lakshminarayanan, Suresh Kothandaraman, Anjaneya Sastry, Seshu Sarma and Sastry Bhagavathula (Rochester,NY). Krishnadas Pisharodi, Srikrupa Easwaran, Rajeev Menon, Uma Narayan, Meher Lanka, Viju Chiluveru, Srini Cherukumilli, Kamal and Namrata Satuluru, Raghava and Malathi Tadavarthi put in tireless efforts to ensure smooth execution of the event. Several key roles were played by Dr. Puneet Panda (Shiva), Ashna Cheemakurthy (Vasuki), Arathi Akella (Dhanvanthari), Sridhar Potabattula (Halahalam), Akhila Takkalapalli (Lakshmi), Lasya Penumarthi (Lord Vishnu). Special credits go to the students who assisted throughout the drama – Ratika Kavuri , Sudha Somayajula , Sesha Lakkakula. Rajasekhar Reddy Aila donated US$10,000 to the mission under the Adopt-A-Village program benefiting Ilavaripalli, Chittoor District of Andhra Pradesh where Sankara Nethralaya will be organizing a camp in September of 2019. Dr. Vasudha Narayanan, Distinguished Professor of Religion and an expert on world religions with a special focus on Hinduism, from University of Florida graced the occasion. Celebrity flute player Nagaraju Talluri ofIndia, Allen Bell, Arts Education Manager, Georgia Council for the Arts, Professor Joyce Flueckiger and Senior Lecturer Tara Doyle from Emory University Religion Department were also among the attendees.